Baton Rouge, La. 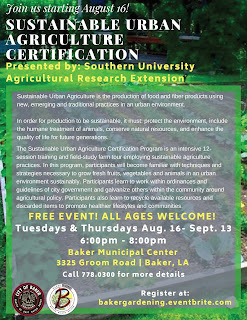 – The Southern University Agricultural Research and Extension Center (SU Ag Center) will hold an Urban Agriculture Certification Program in Baker, LA at the Municipal Center, 3325 Groom Rd. The intensive 12-session training series will teach participants how to use sustainable agricultural practices in an urban environment; with hands on experience. Classes will be held from 6 p.m. – 8 p.m. on Tuesdays and Thursdays from August 16 – September 13, 2018. Topics covered during the series will include: Permaculture and the Environment; Water Harvesting, Irrigation and Composting; Small Scale Agriculture; Animal Husbandry: Poultry, Bees and Worms; Vertical Farming, Hydroponics, and Aquaponics; Maximizing the Use of Land Resources and Infrastructure; Working with City Government within City Ordinances; Construction Techniques, Hoop Houses, Raised Beds; Organic and Sustainable Production and Combatting Diseases and Man-Made Threats. Each class will be led by experts and professors from the SU Ag Center. To date, the SU Ag Center has held three Urban Agriculture Certification programs in St. Landry, East Baton Rouge and Livingston Parish. Interested participants can register for the certification program by visiting, bakergardening.eventbrite.com. For additional information about the certification program, contact Marlin Ford, Ph.D., at marlin_ford@suagcenter.com. 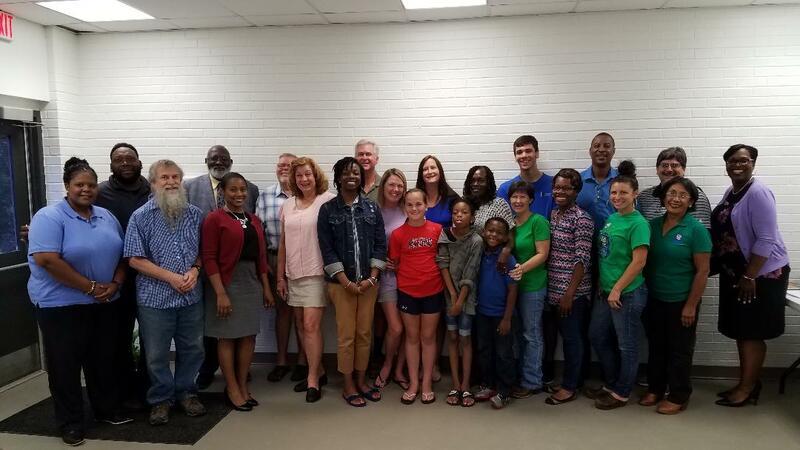 Group photo of the SU Land-Grant Campus' staff members and the participants of its Denham Springs session of the Sustainable Urban Agriculture Certification Program. Baton Rouge, La. 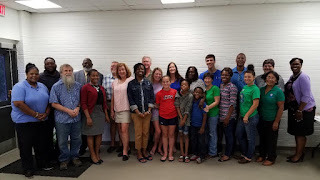 – The Southern University Land-Grant Campus held a graduation ceremony for the participants of its Sustainable Urban Agriculture Certification Program (Denham Springs session) on July 30. Sixteen individuals received certificates of completion during the ceremony, which was held at the Denham Springs City Hall Annex. SU Land-Grant Campus Chancellor Bobby R. Phills, Ph.D., and Vice Chancellor for Extension and Outreach Dawn Mellion-Patin, Ph.D. provided greetings to the nearly standing room only crowd of family and friends. The Sustainable Urban Agriculture Certification Program is an intensive 12-session training and field study certification program. During the certification program participants learned about Permaculture and the Environment; Water Harvesting, Irrigation and Composting; Small Scale Agriculture; Animal Husbandry: Poultry, Bees and Worms; Vertical Farming, Hydroponics, and Aquaponics; Maximizing the Use of Land Resources and Infrastructure; Working with City Government within City Ordinances; Construction Techniques, Hoop Houses, Raised Beds; Organic and Sustainable Production and Combatting Diseases and Man-Made Threats. 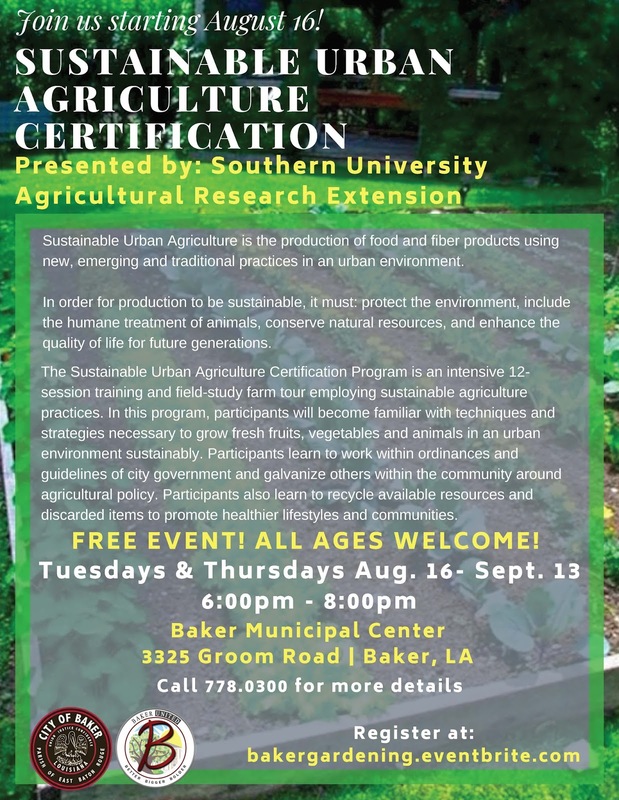 The SU Land-Grant Campus will hold its next Sustainable Urban Agriculture Certification program in Baker, LA at the Baker Municipal Center Auditorium, 3325 Groom Rd. The first session will be held at 6 p.m. on August 16. For additional information about the certification program or for information on the exact dates and times of each session, contact Marlin Ford, Ph.D., at marlin_ford@suagcenter.com.